Tonga was an interesting day for a number of reasons. We had our first protestor/hooligan! He was a pretty funny old guy – running out from nowhere holding his own flame stick. 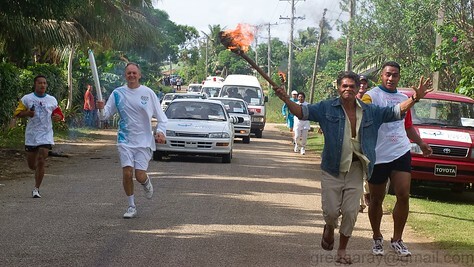 The real torchbearer at the time was the Australian High Commissioner. Perfect timing! 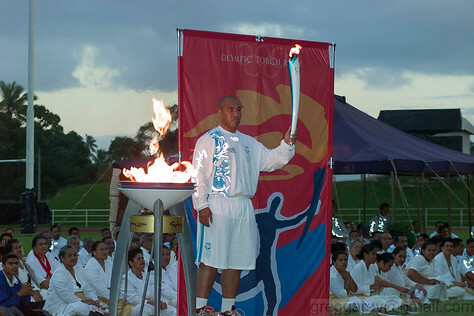 That evening was an emotional moment as the last torchbearer of the day carried the flame into the local stadium in front of his King. His name was Paea Wolfgramm, a Silver medalist in Super Heavyweight boxing at the Atlanta Olympic Games. Tongans paid great reverence to their then King. 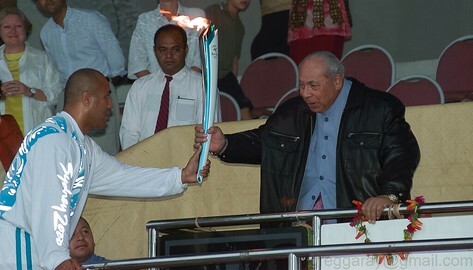 Paea bowed as he handed the torch to the King, who held it , unscripted for just a few seconds then handed it back to Paea. He then went down to light the cauldron. You can see from the images, tears come to his eyes. He was a big man. A boxing champion. But the special moment brought out his raw emotions. A great evening to have been part of.